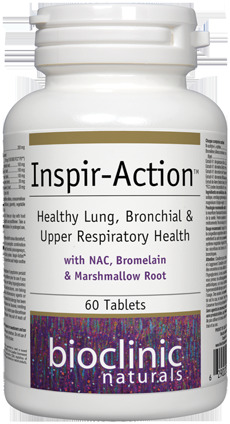 Inspir-Action provides a potent combination of nutrients and botanicals to provide symptom relief and improve respiratory function. 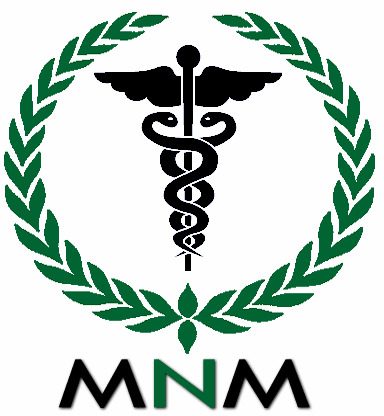 N-acetyl-L-cysteine (NAC) is a well established mucolytic with the ability to break disulfide bonds, and has shown clinical benefit for individuals with COPD and pulmonary fibrosis. NAC has also been shown to attenuate symptoms of influenza-like infection, increase glutathione levels, inhibit activation of the inflammatory NF-κB pathway and modulate immune function. Proteolytic enzymes can also lower the viscosity of mucous secretions, and in a randomized trial bromelain reduced symptoms of acute sinusitis in children more effectively than standard therapy. Marshmallow is widely used for cough and soothing of irritated mucous membranes, with mucilaginous and bioadhesive effects attributed to polysaccharides extracted from the root. English ivy extract increases beta-2-adrenergic bronchial activity, relaxing smooth bronchial musculature and increasing surfactant factors and has proven an effective treatment for acute bronchitis. Extracts of mullein, wild cherry and horehound similarly have a long history of use for various respiratory tract pathologies, complementing this formula with a unique combination of demulcent, emollient, expectorant and antitussive properties to provide symptom relief. Microcrystalline cellulose, croscarmellose sodium, coating (carbohydrate gum [cellulose], glycerin), vegetable grade magnesium stearate (lubricant). Contains no artificial preservatives, colours or sweeteners and no dairy, soy, wheat or yeast. Sealed for your protection. Do not use if seal is broken. For freshness, store in a cool, dry place. 1 tablet 3 times per day with food providing protein or as directed by a health care practitioner. Take a few hours before or after taking other medications. For prolonged use, consult a health care practitioner.